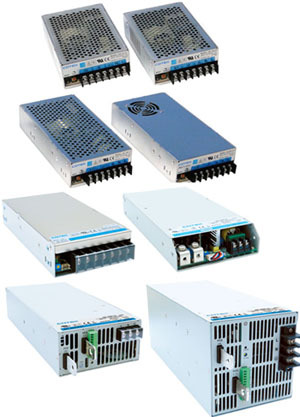 The Cotek AK series of switching power supplies are available in power ratings from 75 to 3000 watts. These power supplies are durable, designed for 24/7 operation at full load for industrial grade applications, and install easily in compact spaces. They acceptable AC input range is 90~264VAC with active PFC 0.98 typical and high efficiency up to 91%. Output voltage is programmable from 30% to 100%, output current is programmable from 40% to 105%. Forced current sharing is implemented for parallel operation. Additional features are high reliability and low ripple noise. Protections include output short circuit, overvoltage, overload and overtemperature. These power supplies are also in compliance with EPA Energy Star requirements for external power supplies.